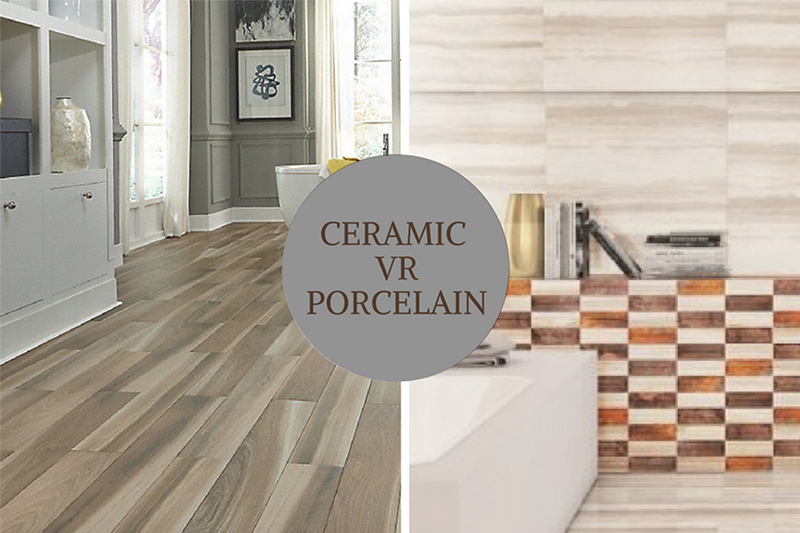 Ceramic Tiles Vs. Porcelain Tiles - Which One Will You Consider? Whenever our clients are shopping for tiles, they do ask what is the difference between ceramic tiles and porcelain tiles? They get perplexed a bit in selecting a tile out of ceramic and porcelain because the difference between the two is very less. Sometimes you are unable to decide which flooring material would be better for your kitchen, bathroom or other room. Should you consider porcelain tile or ceramic tile? Or you might think which would be more durable and easy to maintain? You are aware of both the tiles unique features but to decide which is better than the other is what we will discuss in this article. Though they seem to be similar, some important differences do set them apart. How Ceramic and Porcelain tiles are made? Ceramic tiles are made by molding a mixture of clay, minerals, and water. They are fired in a kiln to apply glaze with the range of colors and patterns. This glazing on the top is what makes ceramic tiles durable and water resistant. While porcelain tiles are made from more purified and refined clay and colored minerals. They are fired in a kiln at high temperature to make more dense and strong tile. A small tip: Ceramic tiles can be used for domestic uses, especially wall tiles and floor tiles unless the floor is deprived of heavy traffic. 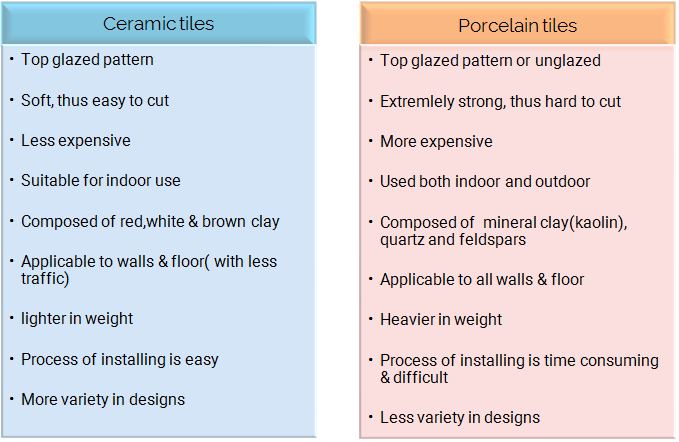 See The Comparison Between Ceramic Tiles and Porcelain Tiles. As we see the major difference between ceramic and porcelain, you can identify which is best suitable for your need. Ceramic and porcelain are the part of the larger category of tiles. Usually, Ceramic tiles are glazed on the top with various designs and patterns which makes them durable and water resistant. Though they are glazed on top, the inner body is soft which makes them absorb some water and therefore ceramic tiles aren’t suitable for outdoors and absorb moisture causing the tile to crack. Porcelain tiles are either glazed on the top or it is completely unglazed. Being fired under extreme heat and pressure makes porcelain tiles harder moisture resistant feasible for exterior use. The raw material used in making porcelain tiles are kaolin (mineral clay), quartz as thinning agent and feldspar as a flux. Generally, to obtain hard porcelain tiles the composition of all the three is used as (50% kaolin, 25% quartz, 25% feldspar). To obtain soft porcelain tiles, (25% kaolin, 45% quartz, 30% feldspar) is used. Further, they are boiled under a high temperature between 1200 - 1400 degrees C and often contain fewer impurities than ceramic and considered to be more impervious. Porcelain contains more kaolin than ceramic. Thus, the porcelain tiles absorption rate is 0.5% or less making them more resistant to water. Ceramic tiles are softer than porcelain which makes them light in weight and easy for installation (cut & fit) while porcelain tiles are heavier making them harder for installing and removing. Ceramic tiles are best fit for residential areas with low foot traffic and easy to remove while looking for renovation. While porcelain tiles are best for the commercial area with high traffic and less considerate to change. Ceramic tiles are always cheaper than porcelain due to the difference in the quality. Though the difference, each one has its own properties and fits in particular area. So when it comes to choosing a tile, it depends on which area you are planning to tile. Our experts at Q-BO Digital Wall Tiles can help you pick the perfect tile for your requirement. Just give a call or drop a message at info@q-bo.in. 7 Tricks Using Ceramic Tiles To Spice Up Your Home Decor.